Be the first to share your favorite memory, photo or story of Harrell. This memorial page is dedicated for family, friends and future generations to celebrate the life of their loved one. 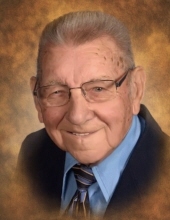 Harrell Morrison, 100 of Norman, passed away on Monday, September 17, 2018. He was born August 30, 1918, the son of the late Hugh Montgomery and Josie Baker Morrison. Harrell married his wife of 76 years, Inez Avanell Henderson on September 28, 1940, and she preceded him in death on November 3, 2016. Harrell lived 97 years on the same farm on which he was born. He graduated from Heltonville High School in 1937 and served in the United States Navy in the South Pacific during WWII. He was at both the battles of Iwo Jima and Okinawa. He worked as a welder for many years at Brunner Engineering in Bedford, Indiana, was a farmer, owned sawmills and did custom farming. For 58 years, Harrell and his wife lovingly cared for their son, Jerry, who was an invalid from birth. Jerry has spent the last 20 years at Hoosier Christian village where his mother and father continued to visit and help care for him. He is survived by his children, Jerry Keith Morrison, Brenda “Jo” (Ren) Landon, Larry Dale (Bev) Morrison and Garry Lee (Shirley) Morrison; grandchildren, Michelle (DeWayne) Silvers, Melissa (Joe) Gibbs, Mirenda (Ron) Scott, Todd (Lynn) Farnsley, Tracy Cox, Doralee (Steve) Manning, Garry Wayne (Cathy) Morrison, Yvonne (David) Cummings, Justin (Jennifer) Morrison, Tammy (Nathan) Bean, Tim Carter, Chris Landon, Patti Cummins and Miles Landon; 24 great-grandchildren, five great-great-grandchildren; sister, Minnie Duncan, sister-in-law, Faye Verble, and several nieces, nephews and cousins. He was preceded in death by his wife, parents, daughter, Karen Jeanette Morrison, four sisters, Alice Sprankle, Edna Sovern, Nora Roush and Inez Speer; three brothers, Millard, Charlie and Albert Morrison; and one great-grandson, Stephen Manning. Friends may call at Winklepleck & Brock Funeral Home on Sunday from 2:00 p.m. to 6:00 p.m. and at the church on Monday after 10:00 a.m. until time of service. Services will be conducted Monday, September 24, 2018, at 11:00 a.m. at Brownstown Church of the Nazarene. Burial will be at Guthrie Creek Cemetery. Full military graveside rites will be conducted by VFW Post 1925, American Legion Post 89, Disabled Veterans 47, Korean & Vietnam Veterans, all of Seymour, Indiana. Memorials may be made to the Brownstown Church of the Nazarene. An online guestbook may be signed at www.winklepleckbrockfh.com. To send flowers or a remembrance gift to the family of Harrell Morrison, please visit our Tribute Store. "Email Address" would like to share the life celebration of Harrell Morrison. Click on the "link" to go to share a favorite memory or leave a condolence message for the family.